King, Anderson, and Trick stand around a table in the haunted Trask Mansion discussing King's new plan -- to get one of the team possessed by a ghost, and then take the ghost out of the house, thereby completing their assignment for "catching a ghost." As the team argues, Jackson shows up with a raw neck. He'd been hanged last issue, but the ghost woman in the red dress freed him, telling him she wanted him to help her escape and find revenge. Meanwhile, the rest of the team searches for Joe in the video room, but finds him gone. As they look, Joe contacts his brother Jay via the monitors, claiming he's doing so from beyond the grave, and tries to warn him about the house. Trick leads Edzia, King, and Jackson to the hidden room where he got a glimpse of hell, and Edzia tries to summon a spirit -- and succeeds. Trick becomes possessed by an evil demon, and King knocks him out cold. The team carries him upstairs to get him outside before dark, but Anderson stops them from leaving. As she and Jackson argue, the sun goes down. Finally, Jay and his video team run outside against Jackson's orders, and an army of ghosts appears and attacks them, seemingly killing them all. Then the ghosts enter the house, and Jackson says that their gig was never just a robbery... it was a prison break. This is another strong issue from Williamson and Sudzuka. The story continues to move forward at a good pace -- fast enough to keep things moving, but not so quickly that the reader is confused. We finally see the ghosts showing themselves openly to the team, which they hadn't been doing before. And the team starts to argue about the best way to approach the situation as the supernatural forces are revealed. There are a number of very enjoyable surprises in this issue. Jackson being saved by the ghost woman in red from the painting, and Joe appearing on the monitors from "beyond the grave" are two minor ones. But the big surprises were Trick becoming possessed, and especially, the fact that most of the ghosts were actually outside the mansion, rather than inside it. Also, Jackson's statement at the end that this wasn't a ghost robbery, but a prison break, was equally surprising. I'm not sure what he means by this, or how he has deduced this, but I assume the explanation will be coming in the next couple of issues. Among the characters, I greatly enjoyed King again. He's a skeptic, but he also comes up with the best and most practical plan for how to capture a ghost and take it out of the house. And even more fun: the plan works! King is a great character, and I hope that, given Williamson's willingness to slaughter characters, King makes it out of this first story arc alive. Speaking of character-killing, I have one concern about this series so far, and that is longevity. 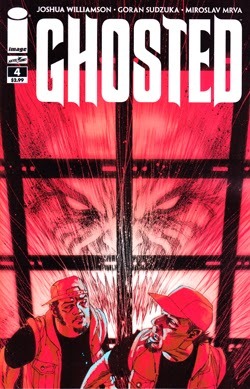 Given what happens this issue, it's hard for me to picture how this series can last beyond the initial story-line of capturing a ghost from Trask Mansion. At first, I had assumed that something during this story would transpire to keep most, or perhaps all, of the team together -- and maybe it still will. However, I can't picture the team being willing to work with Anderson now that she pulled an AK-47 on them, and Jay and Joe are both dead. This leaves Jackson a team of Trick, King, and Edzia. I suppose that could work, but it seems an awful waste of three other characters with high potential. Now, it's still possible that Anderson could end up working with them longer-term, but Jay and Joe are dead. This is a story about the dead rising and haunting people, so maybe Jay and Joe can come back... but again, that's hard to picture. It's difficult to see what Williamson's plan is for the long term with this series, but maybe there isn't one -- it could just be a maxi-series that will stop after a year. However, it's so good that I really hope it continues longer than that. The art on this issue continues to be solid. The layouts are very good -- creative without being distracting. Having complained about the over-use of splash pages in comics like Justice League, it was nice to see that Sudzuka, at least, knows to use them sparingly and at the right time. In fact, other than the opening page (which has traditionally been a splash page in comics for decades), there are no other full-page panels. There are some 2-panel pages and some large panels, but no double-splash pages done for pure shock value. Sudzuka does make the surprising elements appear in larger-than-normal panels, but this is sufficient to convey the effect, and he knows it. The artwork itself is good, with a scratchy, slightly unfinished look that really complements the story. Overall this was another very good issue. I enjoyed it a great deal. I do have concerns about the longevity of this series, as it is being presented, as I stated above. However, the story in this issue is still very good, and I enjoyed it a great deal.